When the lights at your home are flickering or your office’s wiring isn’t up-to-date on electrical codes, you need the help of a professional electrician to safely install and repair your electrical systems. As residential and commercial electricians serving Edmonton and the surrounding areas, the team at Sierra Electrical Ltd. commits to putting you first. We offer a range of services that will ensure your home or office meets electrical codes as well as the needs of your family or employees. You can depend on us for reliable, timely, and efficient services. Here's how we demonstrate our commitment to our clients. Sierra Electrical Ltd. began as a locally owned electrical contractor more than two decades ago. In that time, we've dedicated ourselves to quality work and top-notch customer service. Today, we're still local, and we remain focused on our customers. Anything less than 100% customer satisfaction is not acceptable. Make us your first and only call when you need an electrician. Contractors in Edmonton trust us with electrical work on new construction. Landlords ask us to complete tenant improvements. Homeowners call on us for residential hot tub connections or renovation wiring. Additionally, commercial and industrial clients choose us for indoor and outdoor repairs and installations. We can offer such a wide range of electrical services because our commercial electricians have many years' experience. 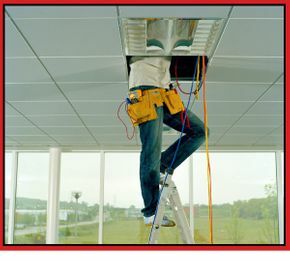 Our staff includes only well-trained and trustworthy technicians capable of completing any job. We know some electrical work requires more than a ladder, so we're ready to serve you no matter what. We have aerial buckets that extend up to 35 feet outdoors and scissor lifts that extend up to 32 feet. We use these vehicles to repair hard-to-reach warehouse lighting, to install outdoor lighting and signs, and more. As commercial electricians in Edmonton, you can trust the contractors at Sierra Electrical Ltd. to prioritize and complete your electrical project effectively and efficiently. We approach all commercial electrical projects with extreme attention to detail and have the experience and ability to complete your project safely and on time. To schedule service or an onsite consultation, call Sierra Electrical Ltd. at 780-944-9400.